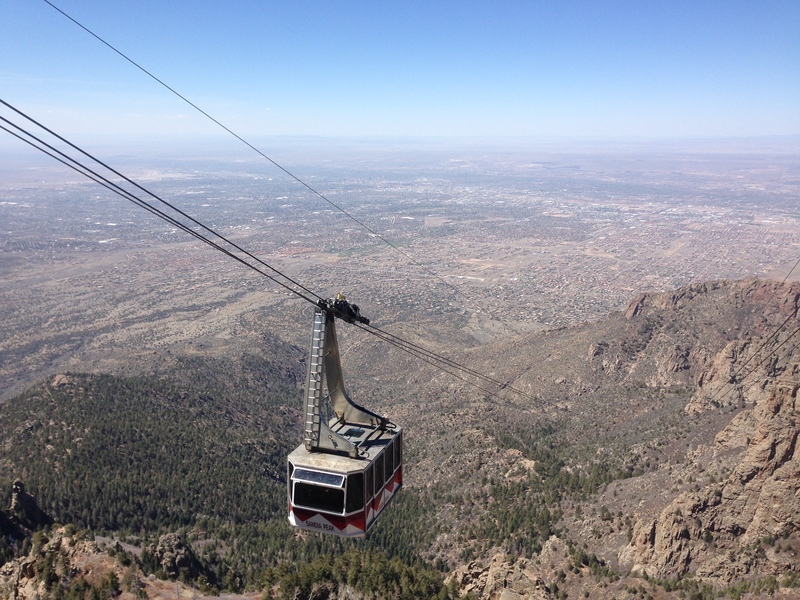 A network of roads, parking lots, gift shops, an aerial tram, a ski resort, and communication towers crowd the top of the Sandia Crest. All that and a stunning view of the sheer drop to Albuquerque below. I sat for hours on a wooden deck near the tram watching the hanging cars rise and fall from the valley below. 4,000 feet up in fifteen minutes. Crowds spilled out every time the doors opened and another crowd squeezed back in to take their place. People churning up and down on $17 tickets. I watched a man climb four steps and complain to his wife about the altitude. People stumbled and wobbled on the lingering snow. I tried not to smile or laugh, feeling conspicuous enough with my beard and ragged clothes, feeling like some wild beast who hadn’t arrived in the floating cars, that had wandered into the middle of a city and would be discovered at any moment. Three guys eventually found me. Ernie, Michael, and Mario. They stuck out too, in their own way. They weren’t wearing bright rain jackets that had never seen a drop or layers of fresh-off-the-rack fleece. They didn’t treat the ride up the tram like an expedition, they treated it like what it was, a Disney ride, an easy lift to the top, a way to cheat that nasty climb, and a stunning view that made it all worth it. They were honest about it, relishing it in their shorts and t-shirts, enjoying the hell out of the ride. We talked and laughed and shared stories. They told me about trucking and chemicals and where to find the best Mexican food in Albuquerque. I told them about the walk from Phoenix and how it wasn’t my longest, and how trail people always call me “Out of Order.” They saw right through my beard, my ragged clothes, my dirt caked skin. They made me feel like part of society again, like I could still connect with people, could still laugh at jokes and share stories, and make new friends. We shook hands and gave each other hugs when it was time for them to head back..
“So what’s next, man?” Michael asked. I didn’t know the answer. I looked out at the city and didn’t know, didn’t know how I’d fit into the world, how I’d ever find a place. He smiled at me as if he could see right through me. I camped three miles from the trail’s end, dropping a few thousand feet to a ridge overlooking the city’s lights. Posted in Grand Enchantment TrailTagged advice, GET, grand enchantmentBookmark the permalink. I am already feeling the withdrawal and angst of the end of your GET journey and your journal entries that I have enjoyed and eagerly looked forward to. I’ve actually become addicted. And now, as with the conclusion of the “Angle to Key West and back”, I will remain anxious, hoping for and awaiting the next Out of Order adventure and your exquisitly crafted writings of life on the trial. Good luck, Daniel…all the best and thank you. Trial? Trail? Is there a difference? Great story D. As we all know, the top of a mountain or the middle of Manhattan are special places. It is all in how you perceive them through our individual filters. Make sure your filters are broad enough to always let lots of light come in wherever you are at.